Guest post by Diversified Human Resources (DHR). HR managers have a number of responsibilities, but two of the most important ones are keeping company employees happy and productive, and making sure the company is in compliance with state and federal employment laws. 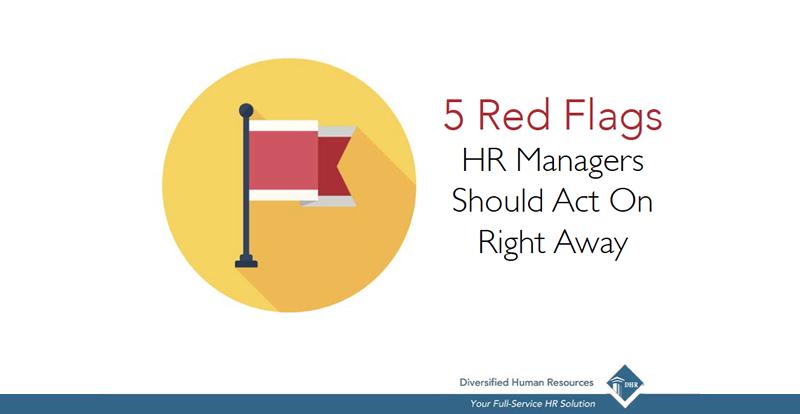 While there is no shortage of things for an HR manager to worry about, there are five red flags that any organization must address right away to keep the organization running smoothly and to avoid legal issues. Laws and regulations are constantly being updated and changed, and in the current environment, there is likely to be more change than ever. If your organization does not have someone who is tasked with staying on top of these legal changes, especially to laws such as FLSA and ACA, you could be opening the company up to significant legal exposure. Simply waiting to see an update on LinkedIn or from your favorite email newsletter is not enough. It’s imperative to dedicate an employee or outside HR services professional to proactively follow what is happening with current and proposed changes that affect the organization. Employees may complain about corporate trainings, but studies show that managers and staff are more productive and less likely to create liability problems when they have been properly trained. Keeping current with training can foster a happy, healthy and constructive work environment. When employees or contractors are hired, certain documents must be filled out. Employees need to complete an I-9 and W-2. Contractors should submit the information needed to produce a 1099 at the end of the year. And all of these documents are subject to different state and federal requirements. It you have not recently audited these documents for accuracy and to make sure all document retention laws are being followed, you could be sitting on a liability landmine. Regular internal audits can help find problems early while providing time to correct them before the government conducts an audit. Employees need access to an updated policies and procedures manual to make sure they are always acting in the best interest of the company. Having an up to date manual also helps avoid mistakes in the handling of sensitive information. Manuals are especially important in times of crisis. Having an up to date set of rules and steps can keep the organization running smoothly, no matter what crisis or issue it is facing. When updating the policy and procedures manual, it’s important to also make sure there is a section dealing with cyber security threats and protecting sensitive company and employee information. The first rule all HR managers learn is to document everything. However, documentation often goes by the wayside as managers spend time putting out a variety of different fires. Documentation is critical to defending your actions should they ever be called into question, as you cannot always rely on your memory when it comes to the details of why and how you handled a given situation. If there is ever an Equal Employment Opportunity Commission (EEOC) claim or some type of litigation, you will be glad you have your documentation to turn over and to rely on. Your documentation system does not have to be fancy. It could be as simple as having a Word document that you update or emails that you send to yourself. What is most important is that you are consistent in documenting everything. Diversified Human Resources (DHR) is the leading full-service HR solutions provider based in Arizona, with offices in Denver. Since 1996, DHR has served thousands of Arizona and regional companies with payroll, benefits, HR administration, retirement, and workers compensation solutions. Contact us today and learn how easy it is to tailor a plan to upgrade your HR function and improve your bottom line.